John Betjeman was undoubtedly the most popular Poet Laureate since Tennyson. But beneath the thoroughly modern window on Britain that he opened during his lifetime lay the influence of his nineteenth-century forebears. This book explores his identity through such Victorianism via the verse of that period, but also its architecture, religious faith and -- more importantly -- religious doubt. It was, nevertheless, a process which took time. In the 1930s Betjeman's work was tinted with modernism and traditionalism. He found Victorian buildings 'funny' and wrote much in praise of the Bauhaus style, even though his early poetry was peppered with Victorian references. This leaning was incorporated into a greater sense of purpose during World War II, when he transformed himself from precious humorist into propagandist. The resulting sense of cohesion grew when the dangers of post-war urban redevelopment heightened the need to critique the present via the poetics of the past, a mood which continued up to and beyond his gaining the Laureateship in 1972. This duty proved to be a millstone, so the 'official' poems are thus explored by the author more fully than hitherto. 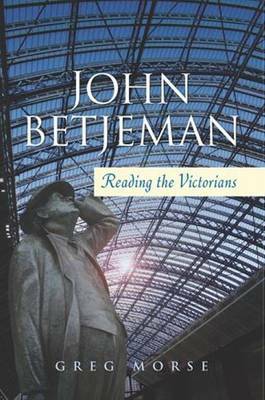 The conclusion of John Betjeman: Reading the Victorians looks back to Betjeman's 1960 verse-autobiography, Summoned by Bells, which is seen as the apogee of his achievement and a snapshot of his identity. Included here is the first critical appreciation of the lyrics embodied within the text, which are taken as a map of the young poet's literary growth. Larkin's 1959 question 'What exactly is Betjeman?' then leads to a final appraisal of his originality, as evidenced by his glances towards postmodernism, feminism, and post-colonialism. The fact is that Betjeman never quite fits in anywhere. He is always a square peg in a round hole or a round peg in a square hole -- often for the sheer enjoyment of so being. In a sense, his desire to be as non-conformist as a Quaker meeting house makes him a radical, rather than the reactionary that his interests imply. He was a champion of beauty and the British Isles, and clearly did much to make us see the worth of our Victorian forebears. Greg Morse's book highlights this important facet of his work.